Source: CICH graphic created using data adapted from Casati, B., 2010. Analysis of the daily minimum and maximum temperatures. Ouranos – Consortium on Regional Climatology and Adaptation to Climate Change, Montreal. 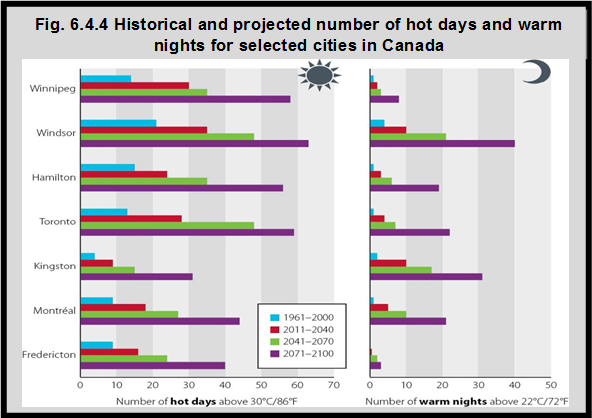 It is projected that the number of days with temperatures above 30°C in Toronto, Winnipeg and Windsor will double between 2011 and 2040. Change Adaptation; Cambridge University Press, Cambridge, United Kingdom. https://www.ipcc.ch/pdf/special-reports/srex/SREX_FD_SPM_final.pdf-accessed July 24, 2017. 3Ebi, K.L., & Paulson, J.A. (2007). Climate Change and Children. Pediatric Clinics of North America, 54, 213-226.